This is part 2 of Great Chefs of New Orleans: Austin Leslie, which I’ve been working on with my friend Texas Chef Bill Moran. 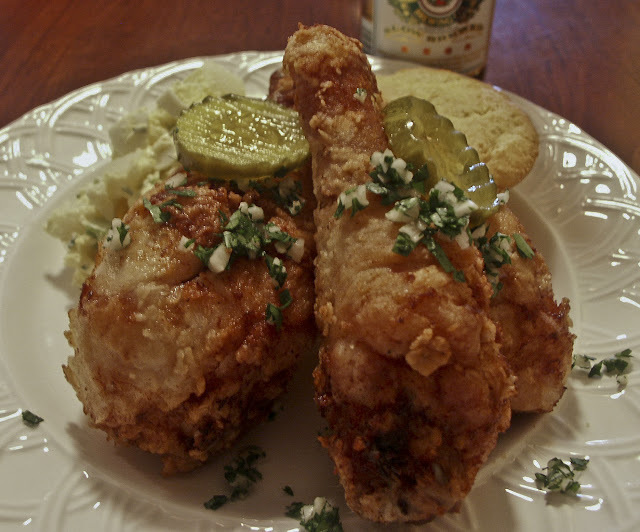 Like I said, with each Chef we feature, we will include a recipe that he/she is most famous for, in this case Austin Leslie’s Fried Chicken. A lot of people think Austin Leslie had a secret ingredient, heck, maybe he had a little secret, but I believe his main secrets were patience and knowledge. “The first time I cut up a chicken I was working at Portia’s. The chef there , Bill Turner, asked me where I learned how to do it. I said I learned from my mother at home. He taught me how to get twelve pieces from a whole chicken; my mother was able to get thirteen pieces from the same chicken because she broke the back into two parts. I learned all about fried chicken from Bill Turner, too. It’s the easiest job in the kitchen. You can tell by the sound when fried chicken is done. If you listen to it, you can hear how the sound of the grease crackling in the fryer changes. Then you know it’s time to bring it up. I never cook it well done; I never cook any meat well done. What I do is take the blood out of it first-while the chicken is frying, take a pair of tongs and squeeze each piece. Squeeze it till it bursts to let the blood out. You can look right down there by the bone and see if there is any blood there. When it’s ready the chicken will float to the top, a part of it will stick up. Then you take it and check it over. If you cook it properly you can keep your guests or customers from ever seeing any blood. That’s what they object to, when they prefer well-done meat-not the taste, but the blood. If you’re serving fried chicken to twelve people you will need three chickens so you can provide three pieces each. The wings-two pieces; the breast-four pieces; the back-two pieces; the thighs-two pieces, the leg-two pieces; that’s twelve in all. Since people want to handle chicken easily when they eat it, we cut it that way. Actually we can fry it just as well in larger cuts. When you cut it properly you won’t loosen the skin. You start by cutting it down the back. Split it down the middle. Then take a sharp cleaver and place the chicken firmly on a block and hold it down. After you split it down the back, then you open it up and take out the insides and put them aside. Then you cut straight through the breast. Cut it into quarters with the cleaver, seperating the thighs from the breast. Then disjoint it at the wings, and disjoint the legs from the thighs. If you use a cleaver, be careful. If you use a knife, always cut away from yourself. Always move all other knives away from the board when you use a cleaver because you can mis-strike, and if that cleaver hits a knife, it can jump up and hit you. After the chicken is cut up, salt and pepper it, mixing the pieces around so the salt and pepper get all over the chicken. Heat oil in a cast iron skillet to 350 F, the oil should come about halfway up the sides of the skillet. Adjust the amount in accordance with the skillet size. Combine garlic and parsley (persillade) in small mixing bowl and set aside. Wash chicken pieces in cool water, pat dry with paper towels and sprinkle with salt and pepper. Set aside. In a medium mixing bowl, whisk egg, evaporated milk and water. Season with salt and pepper. Place flour in a separate bowl. One piece at a time, starting with heaviest pieces, dip chicken into egg wash, squeeze, dip into flour and place gently in skillet. Do not overcrowd skillet. Maintain temperature of 350 F. Use tongs and long fork to turn chicken often for 7-8 minutes. Remove chicken from oil with tongs, pierce with fork and squeeze. Place chicken back in oil approximately 7 to 8 minutes. Chicken is done when no longer hissing and juices run clear. Remove from oil and place on paper towels to drain. Immediately top with a sprinkle of garlic and parsley mixture. Continue until all the chicken is cooked. Garnish each piece with a slice of dill pickle. Austin Leslie Obituary thread at Mr. Lake’s Nonpompous New Orleans Food Forum.